The author has written a series of books of ancient societal mythologies. In this book, he sets out to explore the Fertile Crescent, and ancient Egypt, in particular. Part One focuses on the myths associated with Isis, Osiris, Seth, and Horus. Clayton narrates in the third person, interspersed with imaginary dialogue between the gods. He moves on to the most popular creation stories. Clayton next weaves together how the gods and humans came to interact with each other. In Part Two the author zeroes in on the darker sides of Egyptian religion discussing gods who inflicted chaos upon the world, specifically Apep the snake, and Seth the god of war and confusion. Part Three is the section focusing on what we know of the history of Egypt and the mortals who interacted with the gods to change it. Readers learn about Chancellor Imhotep and how he assisted the king in uniting Egypt. Clayton explores Amenhotep IV and the chaos that ensued over Ra and Aten, the sun gods. Then the story evolves to the reign of Ramesses and his struggles against the Hittite enemy. Finally, the reader is brought to the final stages of the Egyptian empire under Cleopatra and Roman rule. Clayton packs a lot of information into this volume of fewer than one hundred pages. 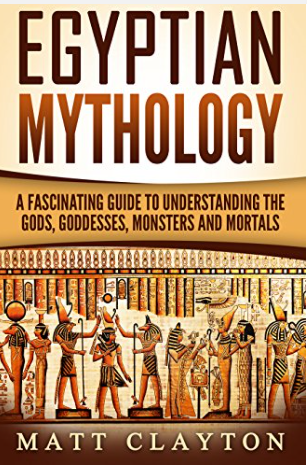 The author has done a good job in constructing an easy to follow narration of thousands of years of myth and history. Perfect choice for adults who would like a taste of the subject as well as for middle-grade students studying Egyptian history.